Soosiamanickam Arockiasamy is the Head of Reliability Department at Salalah Methanol Company with responsibility for Reliability of the Methanol Plant. Prior to joining Salalah Methanol Company. Samy worked in Plant Inspection and Construction Inspection at several companies, including AAJGAS UAE, QAFAC Qatar, and ABS Consulting Middle East. Notable is his 5years as Inspection Surveyor for ABS Consulting. 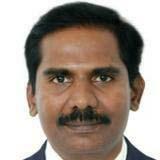 Samy received bachelor degree in Mechanical from Regional Engineering College, Trichy from 1989 to 1993.